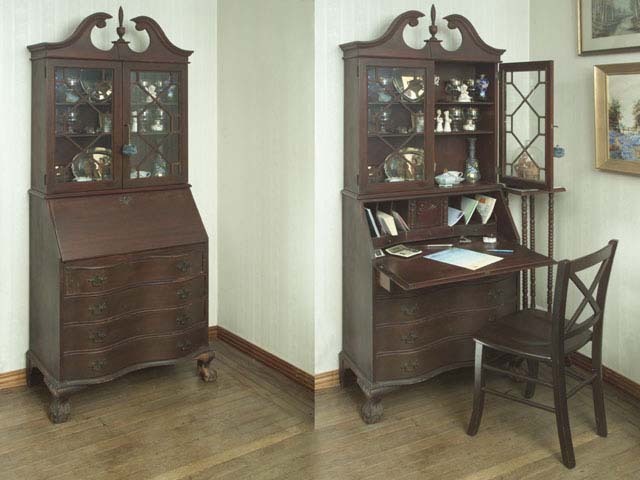 A beautiful, antique, claw foot, solid hardwood fold-out secretary with automatic sliders. It has two shelves in the upper, locking cabinet. The secretary section also locks and has one compartment with a door, three small drawers and six letter cubby holes in the middle. Beneath the writing section are four full depth, full width drawers below. It stands 80" tall X 32' wide X 16.5" deep. "3844 MAHG" is stenciled on the back, upper panel.....$500 - SORRY! SOLD!! !